The Selection tool allows you to select objects like brushes, entire entities or bezier patches in your map and move, scale, rotate or shear them. Apart from these functions directly activated by the Selection tool, CaWE provides a lot more functions that are related to selected objects. Since these functions are only usable with one or more objects, the Selection tool is a very important instrument to create maps. You can activate the Selection tool by clicking on the related icon marked in the left screen or by pressing the SHIFT+S keyboard shortcut. To select an object, click the object once. In the 3D view, click on any surface that is part of the object to select it. 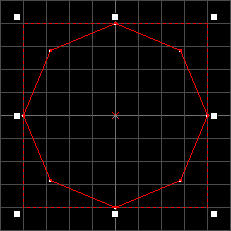 In the 2D view click either on an edge that is part of the object or on its center marker. In the 3D view, the surface of the object will be changed in color and its edges are colored yellow to mark it as selected. 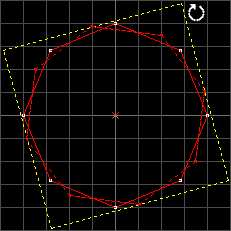 In the 2D view, the edges of the selected object are colored red. To select one or more objects you can also drag a selection box in a 2D view window. Releasing the mouse button opens the selection box, but does not select the objects yet. You can move and scale this selection box until it covers all objects you want selected. To eventually select the objects, press the ENTER key. This way all objects that are covered whole or partially by this selection box are selected. Note that you can also scale the selection box in another 2D view to create a spatial selection box and narrow down the selected objects. You can change the behavior of a selection box in the Configure CaWE Options dialog at the 2D Views tab. Automatic infinite selection in 2D windows (no ENTER) enables you to drag a selection box and instantly select all objects by releasing the mouse button instead of pressing the ENTER key. This way however you loose the ability to open a spatial selection box. If Selection box selects by center handle only is activated, only objects whose center handle is covered by a selection box count as selected objects. Another way to select more than one object is to select objects while pressing the CTRL key. This way you can choose as many objects as you want and perform an action on all these objects simultaneously. You can select all objects in a map by clicking the Select All option from the edit menu. To deselect all objects, use the Select None option from the edit menu. You can also deselect all selected objects by pressing the ESC key, which clears the selection. Now that one ore more objects have been selected you can perform actions on them. By clicking inside the selection box of an object, you can drag it in a 2D view and move its position to a new location. If grid snapping is activated, you can ignore it while moving the object by pressing the ALT-key. This also works with the transformations described below. You can also move objects with the “arrow” keys, if you select the Arrow keys nudge selected object/vertex option in the Configure CaWE Options dialog under 2D Views. An easy way to duplicate objects is using the Clone function while moving an object. Simply move your object as described above, but before releasing the left mouse button to move the object, press and hold the SHIFT key. In this way a clone of the object is created at its new location. Note that cloning an object while moving it with the “arrow” keys is not supported. 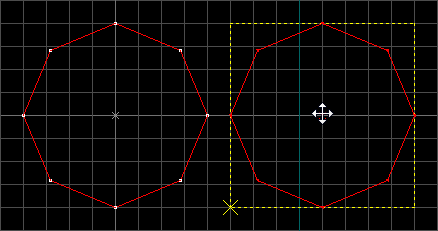 To resize, rotate or shear an object you have to select the appropriate transformation mode. You can switch between the 3 modes by clicking inside the selection box of the object you want to transform. 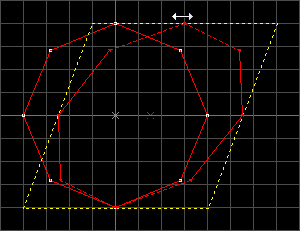 Different transformation modes are marked by handles at the edges and vertices of the selection box. 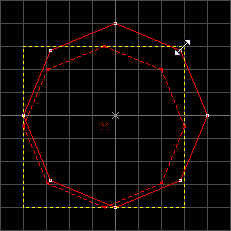 A dashed rectangular box is drawn around a selected object by the editor (this box is only visible if the object itself isn't rectangular). 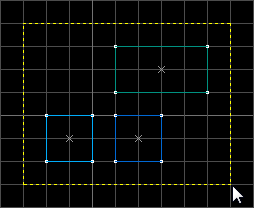 The resize mode is marked by white squares at the edges and vertices of this box. 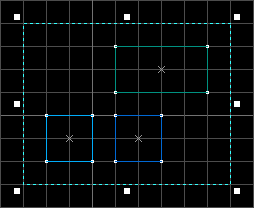 By moving the mouse over one of these squares and dragging this square by holding down the left mouse button you can resize the object in the direction of the square you clicked on. 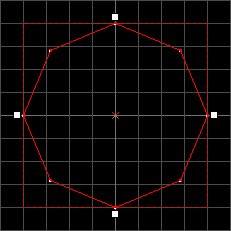 The rotate mode is marked by white dots at the vertices of the box. Moving the mouse over one of these dots and dragging this dot by holding down the left mouse button rotates the object smoothly. It is also possible to rotate the object in multiples of 15 degrees by pressing and holding down the SHIFT-key while rotating an object. You can change the default behavior to rotating in 15 degree steps if you select the Default to 15 degree rotations option in the Configure CaWE Options dialog under 2D Views. If this option is select, pressing SHIFT will allow you to rotate the object smoothly. White squares at the edges of the selection box mark the shearing mode. By left clicking on a square and moving the mouse while holding the left mouse button down this edge can be moved in two directions along its own axis and in this way the object is deformed. To delete a selected object just press the DEL-key on your keyboard or choose Delete from the Edit menu. There are a lot more things you can do with selected objects. These additional functions are explained in the documentations of the Edit menu, Map menu, View menu and Tools menu. Once the Selection tool is activated, its option bar is visible above the view windows. This bar contains selection parameters and buttons for further functions related to selections. Ignore Groups: This option specifies if grouped objects are selected as a group (selecting one object selects all objects) or if groups are ignored and objects are selected normally even if they are part of an object group. Lock Materials: This option determines if the Material of an object is locked to the object itself and therefore doesn't change, even tough the object is moved. If this option is not selected the Material is locked onto the point of origin of the world coordinate system and therefore the part of the texture visible on the object may change when the object is moved. Group: This button puts two ore more previously selected objects into a group. Grouped objects can be selected all at once by clicking on one object of the group. Ungroup: This button reverts grouped objects back to single objects. This function only works if a group of objects has previously been selected. Hide: Hides all selected objects from the view windows. The objects are not deleted, but simply not displayed, which is particularly useful when working with big maps that contain a lot of objects. Hide Other: Hides all objects except the selected objects. For more information about hidden objects, please refer to the VisGroups documentation. Apply Material: Applies the material that is currently selected in the materials bar to the selected object(s). If a box selection is opened → selects all objects that are part of the box selection . If a box selection is opened → closes the box selection. If an object is currently resized, rotated, sheared or moved → move object back into original position and form. If objects are selected → deselect objects. Deletes the selected object(s) from map. If in selection-mode → add new selected objects to selection list instead of removing old selection and only selecting clicked object. 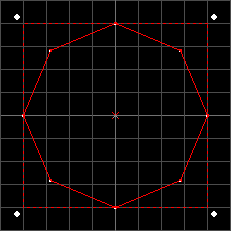 If Rotating an object → rotate in multiples of 15 degrees. If moving an object → object is cloned first then moved, so original object remains in place. If last select click covered more than one object → cycle trough objects.